Deputy President Kgalema Motlanthe, speaking at the M&G 20 Years of Economic Transformation Summit, has commended SA’s economic gains since democracy. South Africa has recorded steady gains in its bid to address structural imbalances of the past, says Deputy President Kgalema Motlanthe. Notable among these gains include growing access to economic opportunities for previously disadvantaged South Africans. Speaking at the Mail &Guardian (M&G) sponsored round table discussion on20 Years of Economic Transformation held in Sandton on Wednesday, 29 January, Motlanthe said the post-Apartheid government led by the African National Congress (ANC) inherited “an economy that was in crisis; depended heavily on mineral exports; and was characterised by deep inequalities and rising unemployment”. Motlanthe said that since 1994, the South African economy has grown at an average rate of over 3% a year, compared to a growth rate of just under 1.5% in the 15 years before democracy. In addition, great strides have been made in improving employment figures. From the late 1970s to 1994, no new jobs had been created, but after the new dispensation, employment figures grew by 4.5 million, or 45%. “Economic growth since then has stabilised this employment ratio, with around 42% of adults employed today – still far too low by global standards, but at least some improvement on the past. Motlanthe said achievements have been made in reducing poverty, improving investment prospects, growing the share of the labour force with a post-secondary by 17%, and making sure that those in positions of power are more representative of the country’s population. These challenges include the widening gap between the “haves” and the “haves not”. He added that some economic commentators have even noted that inequality in South Africa is worse than 20 years ago, and that in 2011 the Gini coefficient was still around 0.65; “extraordinarily high by global standards”. “The richest 10% of households still get over half of our national income,” he said. The Gini coefficient is a statistical representation of income distribution in a nation’s population. A Gini coefficient of one represents extreme inequality. In addition to the widening gap between the rich and the poor, Motlanthe said the economy has not “diversified” enough and, singling out the manufacturing sector, he said growth in this industry has been slow. “The fastest growing industries have been telecommunications and the financial sector. In contrast, manufacturing has fallen from 20% of the GDP to 10% in the past 18 years.” He said that to ensure sustained growth going forward, government needs to reverse this trend. 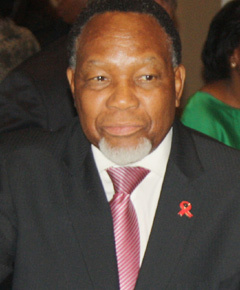 Motlanthe added that since the initiation of the county’s democracy, the government’s main economic objectives have been to create jobs, eliminate poverty and reduce inequality, while simultaneously maintaining investment and growth. Policy shifts included redirecting government investment in social services and infrastructure towards historically disadvantaged communities; introducing labour rights and a new skills system, and industrial and trade policy measures to diversify the economy and support employment creation. Apartheid laws denied Africans opportunities to own businesses. To overcome these historic obstacles and promote higher growth rates, increase employment and promote more equitable income distribution, the South African government has adopted various approaches to support black-owned small, medium and micro enterprises (SMMEs). In addition, government decided to implement the Broad Based Black Economic Empowerment Act (2003), and then introduced the BBBEE Codes of Good Practice. Lessons can also be drawn from the past 20 years; Motlanthe said it is not enough to strive for growth if that is not in the context of an equitable economy. This means government will have to relook its employment creation policies, access to education and training, and equitable earned incomes. He added that even BBBEE codes have to be revisited. He notes that the persistence of inequalities in the workplace has become a key challenge, a situation that can be described as a time bomb, saying, “If we do not address these underlying factors behind workplace conflict, we cannot hope to bring about a more productive economy. To address infrastructure improvement, the government developed the National Infrastructure Plan to stimulate growth in the local and regional economy through, among others, addressing backlogs in rail and the ports; driving rural development through extending the logistics network; and improving the basic education and post-secondary system infrastructure. Other speakers included IDC’s Lumkile Mondi; Nomonde Mesetywa from the Department of Trade and Industry; finance analyst Duma Gqubule; Progressive Professional Forum’s Jimmy Manyi; and Siviwe Mkoka from the National Youth Development Agency.